From near to far, Declan Whelan, Samuel Crescencio, Pat Reed (slightly hidden), Linda Cook, Ola Ellnestam, Dr. Rebecca Parsons, Phil Brock, and our facilitator (standing). Not pictured are Juan Banda, Shane Hastie, and me. Some of you may recall that I was nominated to the board of the Agile Alliance for the 2015 to 2017 term. Well, 2015 is upon us and I am officially on the job. This month, I traveled across the U.S. from sunny Florida to cold, rainy Washington for my first official board meeting hosted at the CenturyLink Cloud offices in Bellevue. What a lovely quaint downtown Bellevue has to offer and OMG! … the restaurants and pubs are unbelievable (I highly recommend Lot No 3) … anywho, I digress. Bellevue was my first official board meeting but not my first board meeting. I had met most of the board at Agile 2014 in Orlando (except for Samuel) and was asked to attend the Chicago board meeting in September to “observe” which means I didn’t have a vote yet. In Bellevue, I finally got to vote! … Not once, but many times. Oh the power! … MUAHAHA! What I found in Bellevue, and previously in Chicago, was that you can always learn a thing or two from the board meeting experience. The board brings in a professional facilitator for the thrice yearly face-to-face meetings and they always come with a bag of tricks. In Chicago, I was introduced to the Lean Business Model Canvas. 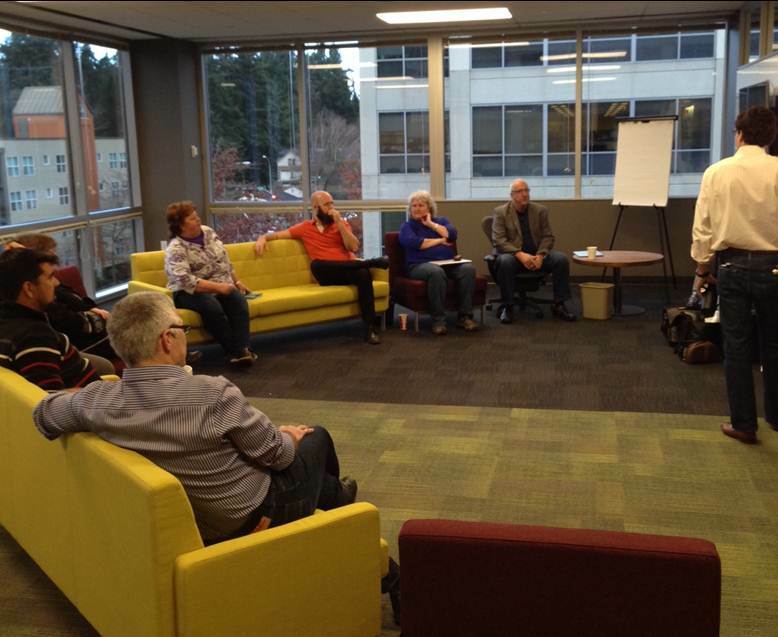 This time in Bellevue we performed two very engaging exercises: 1) Future Trends and 2) Customer Persona Expectations. The Future Trends exercise had us looking towards the future so that we can determine what opportunities to pursue or what risks to mitigate. We kicked off the 3-day meeting with this exercise. It really opened minds to all the possibilities before us. The Customer Persona Expectations exercise was used to identify all our various customers and what they expect of us versus what expectations we are delivering on. Very eye opening in terms of over-served and under-served customer groups. By the end of the 1st day, we got to meet Pam Dyer, the new Agile Alliance Chief of Marketing, and grill her on her plans for the brand and the website. And, let me just say, Pam said a million right things just within the first ten minutes. Under Pam’s leadership, 2015 is truly going to be the marketing awakening for the Agile Alliance. On the 2nd day, we got to connect with the guys of Agile Alliance Brazil over Skype and hear how things are going on that side of the world. Agile Alliance Brazil is fairly new but making great strides in growing and developing all-things-Agile in their country. Then, there was the usual board-ish stuff, namely the budget review, the voting of new Officers, and the review of new and active programs. While this board-ish stuff might sound more like bored-ish stuff, it was absolutely thrilling for a first time board member. Budget … What can I say about the budget? It was … umm … the budget. Linda Cook does a fine job as Treasurer, so the budget review was pleasantly uneventful and went by rather quickly. And, I got to vote! Officers … The January meeting means voting for 2015 Officers, namely Chair, Secretary, and Treasurer. For 2015, Rebecca Parsons remains Chair, Shane Hastie will take over as Secretary from Ola Ellnestam, and Linda Cook will remain Treasurer. Programs … Agile Alliance works their mission through this thing called “programs”. If you don’t know about programs, well you should. Any member can propose a program and that includes me. Mark Kilby, Ryan Dorrell, and I submitted a program focused on local user groups and I got a front and center seat (literally) to the proposal review. What an experience, to say the least! I’ve got some great notes in hand for further developing and refining our program proposal for review at the next board meeting. As I embark on my first year on the Agile Alliance board, I only hope that I can contribute as much as I will learn. I am well aware that I am among an elite group of Agilists and technologists. The positive vibes that surrounded the Bellevue board meeting has, no doubt, left me hopeful of what’s to come in 2015. It’s going to be an epic year! Oh, and I didn’t waste a good trip to Washington on a just meeting. My husband, Sean Davis, accompanied me and we stayed an extra day to explore downtown Seattle and Pikes Place Market. Also, on the first night, our friends Amber Osborne and Nate Brown had us out to Kirkland for a rock opera which was a crazy-wild experience (I’ll leave it at that). We also took time to go see a couple movies, American Sniper and The Imitation Game (which I highly recommend both). Last night, Bob Damato (Valpak’s Software Engineering Director), Terry Winslow (Agile Project Leader), and I had the pleasure of Skype’ing with a graduate class at East Tennessee State University on real-world Agile. Terry also happens to be an East Tennessee State University alum so that made it extra special. This is a capstone class for graduate students who are completing a project to build a mobile app using Agile. The students provided a list of questions and Bob, Terry, and I divvied them up and answered them one by one. It was great opportunity for us to shape and influence our next Agilists by sharing our real-world experiences. 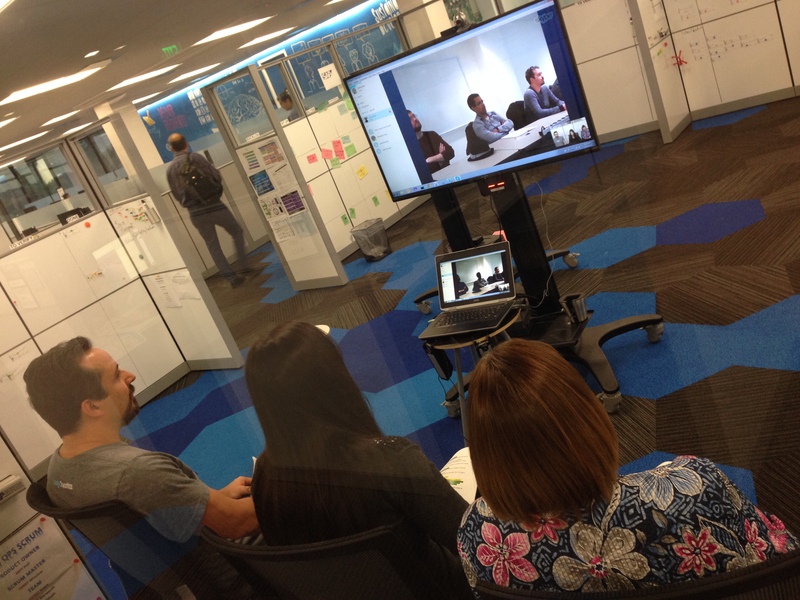 The backdrop you see in the picture is our new Agile boards area where we hold stand-ups each morning. It consists of 360 degrees of magnetic whiteboards we call “The Park”. The Park is home to up to 8 Scrum or Kanban boards and also has portable TVs for display of digital boards.